Caishen's Gold slot joins the Oriental collection from Pragmatic Play including 3 Kingdoms and 8 Dragons which is not necessarily a bad thing as they do them quite well. In this instance we get a plain set of reels on a purple background and the Eastern music is a more funky version until it gets the dramatic pipes and crashing cymbals added when you spin the reels. Caishen is actually the Chinese God of Prosperity in the Tao religion so like me you'll be wondering if his benevolence can find it's way to our cash balance! No pay lines here as we have a 243-way game over the 5 reels of 3 rows each and stacked symbols to help get those multiple ways in one play. Due to the number 8 being lucky in Chinese culture we have an odd stake here of 38 coins so it's best to express the pays in coins rather than multiples of bet. The male Doll is 200 coins for a full way of 5 symbols, female Doll 150, Lotus flower 125, fan 100 and Mandolin 75. There are six card values paying either 50 or 25 coins too. 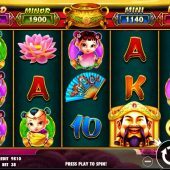 There is a Wild, Caishen himself on the centre three reels and as well as substituting it has another possibly more lucrative function - like WMS's Wishing You Fortune slot we have 4 internal jackpots which are multiples of your 38-coin stake. Mini is 30x bet, Minor 50x, Major 100x and Grand is 1000x. Any appearance of a Caishen Wild may trigger randomly a bonus pick game with 12 gold coins from which you pick until you have three of one of the jackpot symbols. 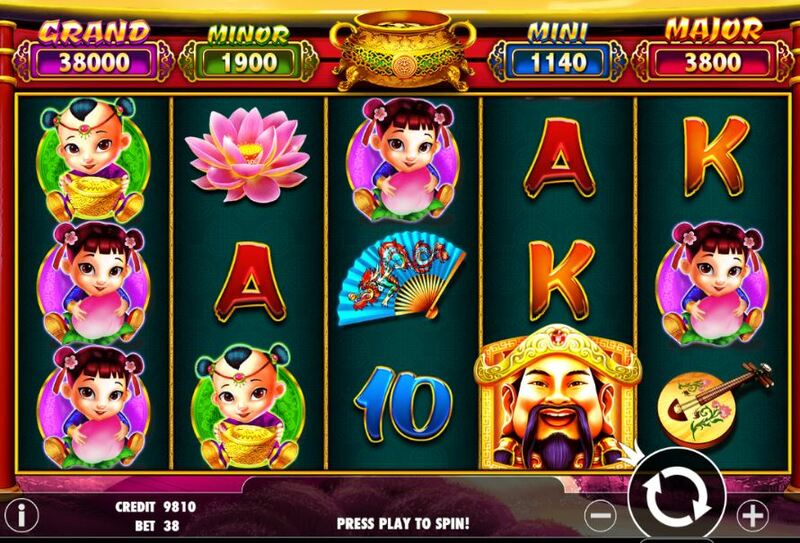 If you see three or more consecutive Golden Pagoda scatters from left-to-right you will be rewarded with 10 free games which can be retriggered indefinitely. Your enhancement is quite simple: all the card values are removed and the result is more premium icons and stacks of them plus the Caishen Wild is more likely to appear thus your chance at the jackpot pick-me game.